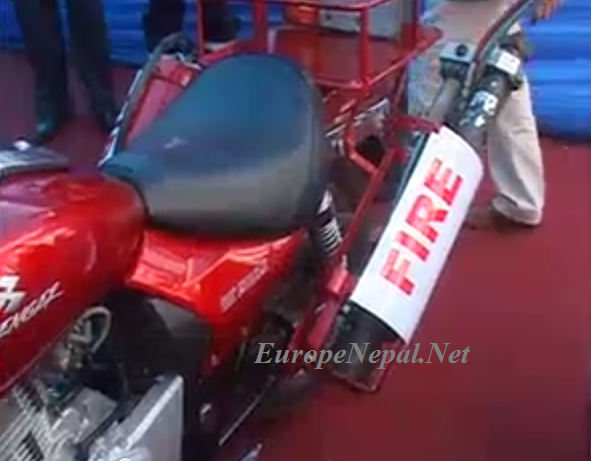 Increasing the capital Kathmandu Metropolitan Fire Control has been used as a special type of motorcycle . Narrow streets and bustling area in Kathmandu TO THE FIRE take control of fires immediately if the company made ​​Bajaj ' storm ' precludes the use of motorcycle is suspected . Forging and company solved the cordon and the captain of the device designed in collaboration with Bajaj, the company has 10 storm motorcycle HLM today handed . Kathmandu , Bhaktapur and Lalitpur, if any at Bajaj hurricanes , fires, fire control for the immediate operating the motorcycle Metropolitan said .